Web Hosting Argentina Review 2019: Is Web Hosting Argentina a Good Hosting? Web Hosting Argentina has been offering website hosting services since 2002. Their servers are located in a top-of-the-line Argentinian data center that boasts an average uptime of 99.9%. Web Hosting Argentina has been offering website hosting services since 2002. Their servers are located in a top-of-the-line Argentinian data center that boasts an average uptime of over 99.9%. Their website is available in Spanish. Web Hosting Argentina colocates their servers in an Argentinian data center. Their network has redundant routers and dual connections, as well as UPS and diesel/battery generators for possible power outages. All racks are powered by two separate power supplies, and they have 24/7 monitoring of their servers. They offer four shared website hosting packages: Basic, Initial, Standard, and Advanced. The plans come with 500MB, 4GB, 12GB, and 35GB disk space respectively, and 5GB, 15GB, 50GB, and 200GB transfer respectively. All plans come with an SSL certificate, unlimited manual backups, and the popular cPanel control panel. 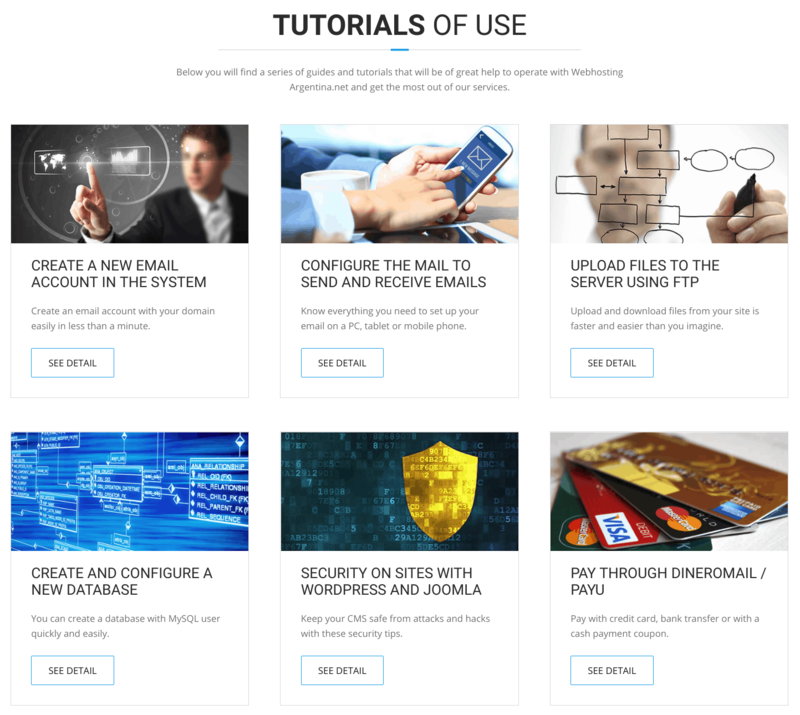 For beginners, the servers come with a website building tool (at extra cost), daily website statistics, antivirus and antispam, and are ready for popular CMS systems such as WordPress, Joomla! And Drupal. For experts, the hosting comes ready for PHP, MySQL, Perl, and Apache. The prices are very affordable and pretty fair for the features and resource levels. SSL certificates are included, but domain registration costs extra. The only contract length options are six or twelve months, and this is also fair enough for the low prices. They also offer a 30-day money-back guarantee, which also helps mitigate the contract length commitment. To get support from Web Hosting Argentina, you can call, email, submit a support ticket or launch their live chat; but only during business hours on weekdays, which is pretty limited. However, you can also support yourself using their large FAQ section and the knowledge base with tutorials. I’ve contacted the company a few times via live chat, and they’ve always been prompt and very helpful. Whilst Web Hosting Argentina might not offer a huge number of advanced-level features, they are very beginner-friendly and have a very good price point. Wondering how Web Hosting Argentina stacks up against other Web Hosting companies? Enter any other Web Hosting company and we will give you a side-by-side comparison.